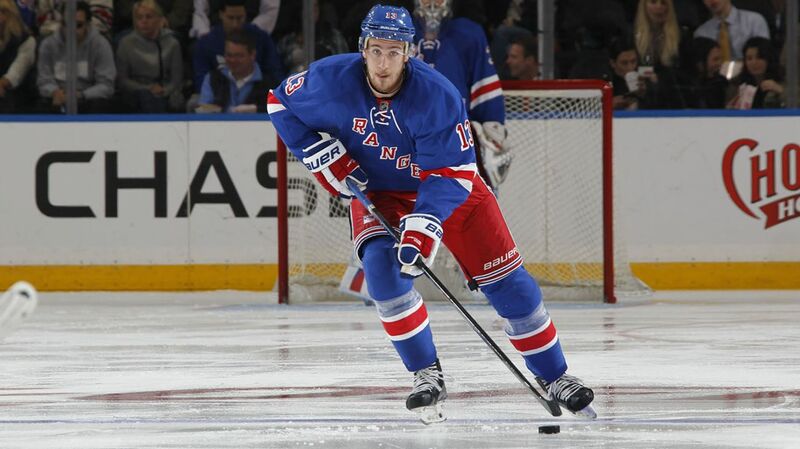 There’s no denying the talent that Kevin Hayes possesses. After deciding not to sign with Chicago, who made him the 24th overall selection in the 2010 draft, Hayes made his way to New York City, earning an opening day roster spot and making his NHL debut in the third game of the season. From that moment on, learning a new position on the fly, Hayes cemented himself into the lineup, improving with each passing game. Hayes wound up centering the third line with an always-rotating cast of wingers. Despite that, he would lead the Rangers in scoring over the past few months of the season, and carried that success into the playoffs. His 45 points (17-28-45) were fifth amongst all NHL rookies, and he was actually tied with Joe Thornton and Tyler Seguin for the most primary assists that year, with 21. Quite good company. He’s got silky smooth hands, fantastic vision, great passing skills, and the ability to score some highlight reel goals when needed. An impressive rookie season and a solid playoffs showed that. What’s also evident is his extraordinarily high hockey IQ. You can tell that when he’s out there on the ice, Hayes is about 11 steps ahead of everyone else. He knows what he’ll do before he gets the puck, and that can be really crucial to being a setup man and exposing holes in the opposition’s defense. But it can also be a detriment. Because he’s so knowledgeable about the game, and because he is steps ahead of people, Hayes tends to overthink things. Sometimes he’ll try to make too many moves, or try and force a pass, or take the complicated route. He’s overthinking things, which is leading to some struggles. Sometimes he’ll wait so long to make a decision that he’s left with no options. His mind is traveling 1000 miles a minute. He needs to start simplifying things and stop thinking so much. Instead, Hayes should let his natural talent shine through, and just lay the game. A player is at his best when he’s in the moment. A puck comes loose in front of the net, and someone picks it up and quickly fires it into the back of the net. In basketball, a player gets the ball with a second on the shot clock and quickly fires up a three. A baseball player uses instincts to quickly react and make a diving stop. That’s when athletes are at their best. When someone isn’t thinking about anything, uses their instincts and makes a play. Kevin Hayes needs to start playing like that. Instead of overthinking and waiting too long to make a decision, just go out there and play. Use your natural talent and just play. Posted on October 21, 2015, in In the Crease and tagged Boston College, Hayes, Hockey, JT Miller, Kevin Hayes, Madison Square Garden, MSG, New York Rangers, New York Rangers blog, NHL, NYR, Rangers, Rangers blog. Bookmark the permalink. Leave a comment.